There’s something very special about Fridays. Whether it’s the end of the school week, the work week, or both, I’ve always felt that Friday was worth celebrating. When I worked downtown, my Friday “lunch” would often be a Starbucks vanilla latte (iced when the weather was warm enough) and a slice of lemon pound cake. This combination would carry me happily through the remaining hours of the week until I got home and could fully embrace the weekend. When Andy and I gave up wheat in the fall of 2012, my Friday treat would simply be a piping hot latte (I’d grown flavor-averse by this point). The coffee guy in my building knew how to foam milk and every latte would have an inch of foam floating on top. I have yet to find any coffee company that could replicate his skillz. By the time my last job rolled around my Friday coffee ceased to be a treat so much as a necessity. Fridays were my heaviest deadline day and I would find myself in the office no later than 5:15 every Friday morning to hit a 10 o’clock deadline that couldn’t be missed. Thankfully, a local drive-through coffee joint opened at 5 o’clock and I could swing through and grab something on my way in. Fast forward to now. My corporate job has fallen by the wayside–a victim of poor planning and international relations–and while I find myself at home during this season of rest I still feel that Fridays are worth celebrating. As much as I relied on coffee to get me through certain days at my last few jobs, coffee and I fight more than we get along. Sure, I love the initial rush of caffeine, but then comes the fall, the headache, the stomach ache, the jitters, the shakes, and the anxiety. I know. 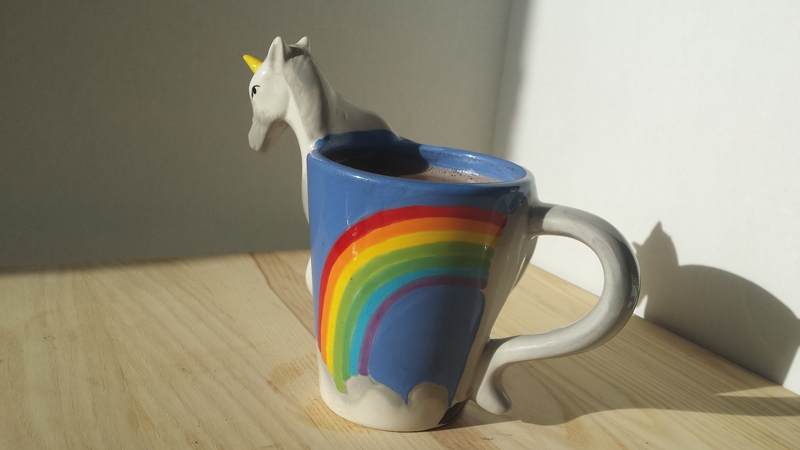 You’re wickedly jealous of my unicorn mug. It’s pretty sweet! Enter brewable chocolate. A former coworker introduced me to the concept and after a little research I found it on Amazon. I prefer this brand/flavor, but play around. Chocolate has just as many flavor profiles as coffee. For me this hits the “treat spot” and makes me feel indulgent without weighing too heavily on my pocketbook or stomach. Quick word of warning–this is not a sweet drink. If you’re looking for flashbacks to the Swiss Miss you enjoyed as a child, you will be disappointed. Also, I’ve found that if I have this later in the afternoon I occasionally have difficulty sleeping that night. Chocolate doesn’t have caffeine, but the theobromine may cause its own energy/sleep complications. Brew the chocolate per the instructions on the package. I make mine in a French Press: Add the grounds to the press, pour in 16 ounces of boiling water, let set for 12 minutes or so, press the plunger. While the chocolate is brewing stir together the coconut milk and vanilla in your mug. I have a battery-operated milk frothing wand that does the job marvelously, but a fork or small whisk works, too. When the chocolate has been pressed, pour it into the mug with the coconut milk. Depending on how cold the coconut milk is, you may need to give it a good stir to fully combine. Again, my little wand is perfect for this. Enjoy the richness and toast a happy Friday! * If you’re feeling adventurous a pinch of cinnamon is also delicious. As, I imagine, almond extract would be. ** In addition to coffee, I’m trying to cut back on dairy. If you don’t have any dairy issues, half-and-half totally works. Feeling even more indulgent? Lightly sweetened whipped cream would be heavenly.